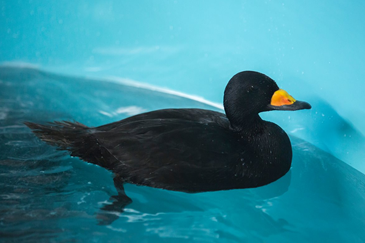 Two weeks ago we reported on a pair of Black Scoter ducks that were recovering with the wildlife rehabilitators at Wild Care in Eastham. Black Scoters are sea ducks that migrate south to our waters from the tundra in winter. These two ducks came in separately within a few weeks of each other. The male scoter was found beached on Nauset Beach in Orleans. The bird was missing the distal tip of his lower beak. The female was found in the parking lot of Beachcomber in Wellfleet. Not the usual hangout for a sea duck! They both arrived dehydrated, emaciated, hypothermic, and had wounds. Scoters are very social, so the two supported each other during their rehab. They swam together in Wild Care’s warm therapy pools and enjoyed spending time with each other. Now fully recovered, the Scoters were released today. Below is the report from Jennifer Taylor, Wild Care Animal Care Coordinator. Black Scoters released following rehabilitation at Wild Care in Eastham. 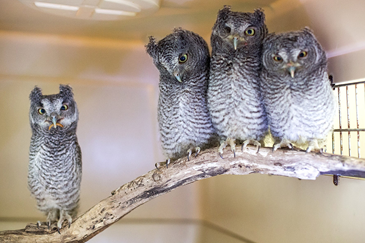 Wild Care photos by Leo Seletsky.